Home » Beast of Burden , Daniel » Updated(3): Beast of Burden competition: Want to talk to Daniel Radcliffe on Skype? 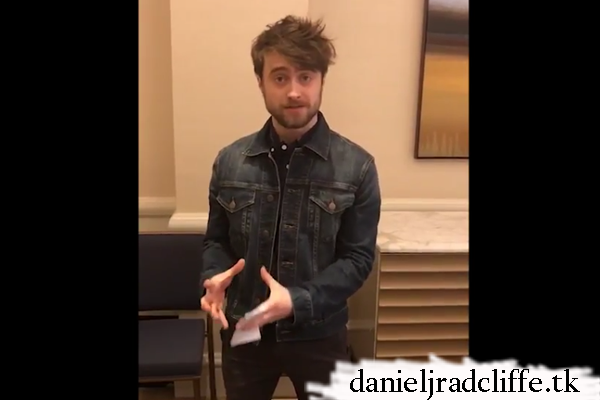 Updated(3): Beast of Burden competition: Want to talk to Daniel Radcliffe on Skype? News for all of you in Russia: Kinologistika and Cinemaus Studio have set up a competition in promotion of Beast of Burden (Опасное задание). The winners will have the opportunity to talk to Daniel on Skype on 12th August 2018 14th August 2018. - Buy a ticket for the film. At your local cinema or online. - Register your ticket online via the form here. - Remember the Serial Number you will receive. The winners will be drawn at random and will be announced on 11th August 2018 13th August 2018 at 19:00pm (time in Moscow). Beast of Burden will be released in Russia on 16th August 2018. ICYMI: I did share the Russian poster on Facebook. Below you find Daniel's message about the contest, recorded on the Miracle Workers press day in New York. He recorded it specifically for the 105th Russian film market which took place in April 2018 in Moscow. Update: 4th August 2018. I have replaced the video below. The other was dubbed, this is one has Russian subtitles. Update: 11th August 2018. The competition is postponed for two days. Update: 13th August 2018. The winners have been announced.